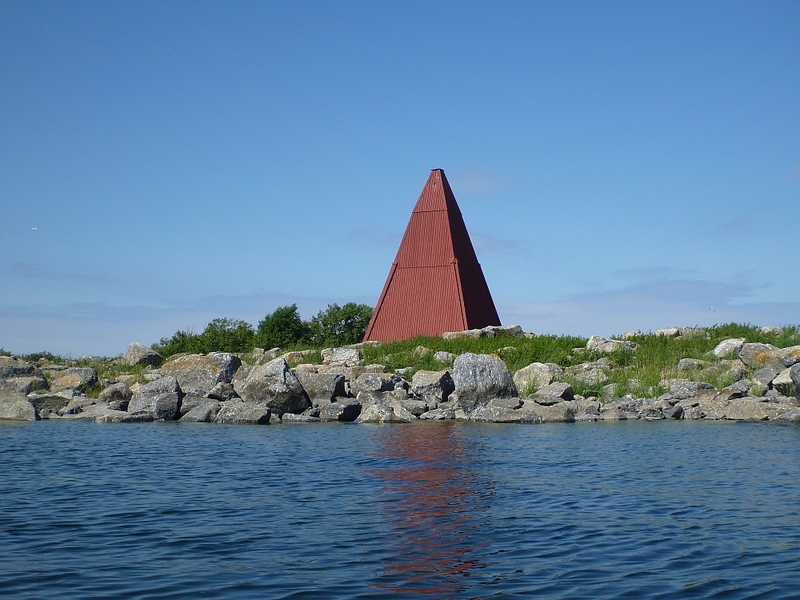 One of the objectives for this year was to visit on Norrskär and Utgrynnan lighthouse islands by kayak. The islands are very remote and there are absolutely no shelter at all for stronger winds or bad weather. After the midsummer I checked the weather forecast and it looked pretty OK. The Monday would be still windy, roughly 5-7 m/s from SW, but Tuesday would be perfect day for visiting these islands. I decided start on Monday at the southernmost tip of the Raippaluoto island towards Rönnskäret - archipelago. On a way I visited Ensten daymark island and started a long, windy and tough crossing over the Gloppet. It took 4 hours to reach Rönnskäret islands and I was totally exhausted. 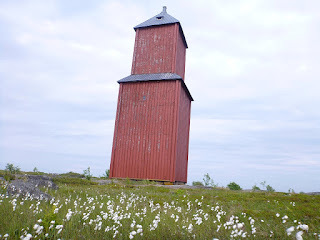 Rönnskäret has old daymark as well and nowadays it's having nature center in one of those islands. The major part of the Rönnskäret archipelago is nature conservation area. I pitched the tent in a stony shore of the Storskäret island after 35 km paddling. I was feeling the headwind section in my shoulders.The first day route can be seen here. At 6 AM my alarm clock rang and I started to prepare for long open sea crossings. I had a decent breakfast and packed my tent and other stuff in my kayak and started paddling. It was 17 km crossing to Norrskär - lighthouse island ahead of me. The wind had calmed down, but it was misty and foggy. After 2,5 hours paddling I was wondering why I can't see lighthouse anywhere. According my GPS it should have been some 1 km away. I was pondering if I had stored wrong coordinates by mistake. Then suddenly when it was only 400 meters to lighthouse it appeared in the middle of fog, oh boy I was relieved. I had a good break at Norrskär, it cleared and sun was shining. I took photos, ate some snack and checked the next crossing. This time 15 km to Utgrynnan - island. I started paddling again and fog appeared again. Similarly after 2,5 hours paddling I was wondering where lighthouse would be, cause it was only 200 meters and I couldn't see it or the island. I was already bypassing the island totally, when on my right hand side there were glimpse of lighthouse in the middle of fog. Unbelievable! I could see the island and lighthouse at 200 meters distance. 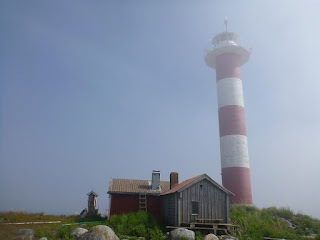 Without my GPS I couldn't have find the lighthouses, which at normal conditions can be seen from 5-10 kms away! I had lunch on Utgrynnan and the last leg of today's crossings were still ahead. 17 km back to Raippaluoto - island was still waiting. All in all I paddled 87 kms during these 2 days. 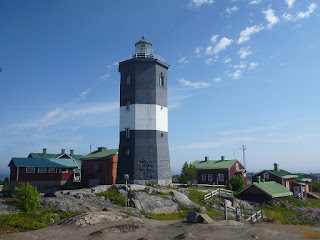 I'm extremely happy I managed to visit both Norrskär and Utgrynnan - lighthouses.They were my 34th and 35th lighthouses in Finland visited by paddling. The second day route and mainly open sea paddling is available here.